"It is important to take advantage of all of the programs that USD offers. It is equally important to network from day one, and to work hard to integrate yourself within the San Diego environmental and energy law community." A: My passions for environmental protection and public service are rooted in my family values. I wouldn’t characterize my family as “green” or environmentalists, but they taught me the importance of thinking beyond myself. Despite having little financial means, my family always stressed the importance of giving back to our community. This is a value that I try to live by every day, and it ultimately led me to pursue a career in environmental law. After college I wanted to educate others about important environmental problems and I wanted to effectuate change. I decided that law school was the next step in my pursuit of that goal. A: I choose USD School of Law because of the programs that they offer as a part of the curriculum, specifically the Energy Law and Policy Clinic and the Environmental and Energy Law Concentration. A: I became interested in energy law during my undergraduate studies at the University of Colorado. My honors thesis was a comparative analysis of first-generation biofuels in Brazil, China, and the United States. My interest continued to grow in law school after taking the Energy Law and Policy course and participating in the Energy Law and Policy Clinic. A: Some of the highlights of my law school experience are serving as the President of the Environmental Law Society; interning for the U.S. Environmental Protection Agency and local environmental non-profits (Communities for a Better Environment and San Diego Coastkeeper); and participating in the Energy Law and Policy Clinic. A: Participating in the USD in DC program was one of the best decisions I made during my law school career. This program afforded me the opportunity to clerk for the U.S. EPA’s Water Enforcement Division in Washington, D.C., which is the division where I currently work. 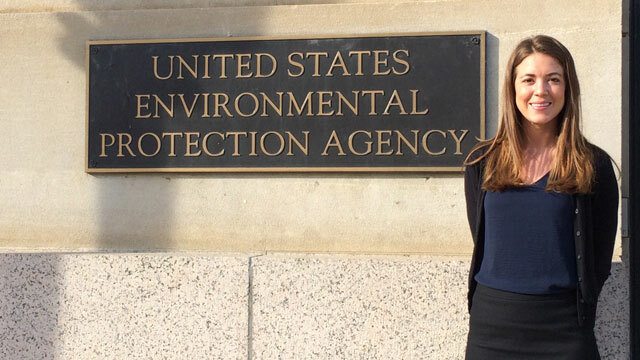 A: Since graduating in May 2015 I have moved to Washington, D.C., where I now work as an Attorney-Adviser for the U.S. Environmental Protection Agency’s Water Enforcement Division. A: USD’s faculty and the strong curriculum helped me further develop my legal skills and my knowledge of environmental and energy law, which are necessary for my current position. For example, the California Water Law course I took is directly applicable to some of the water law issues I work on in my current position. And participating in the Energy Law and Policy Clinic afforded me the opportunity to work with attorneys at the California Energy Commission, who have similar responsibilities as I do in my current position. A: I advise students that are interested in energy law to become involved with the Energy Policy Initiatives Center (EPIC) and to take advantage of the energy law courses and clinics that USD offers. I also advise these students to network within the USD community and the San Diego environmental and energy law community. There are a lot of local attorneys that practice environmental and energy law in San Diego, be sure to tap into this incredible resource.